Sometimes the smallest decisions of your life will effect parts of your journey down the road that you could have never anticipated. So many little decisions have led to ideas and meetings and relationships that have brought me to where I am today. And that’s the thing about life, it’s the little steps in your journey that often end up being the most important. You never know where those little steps & decisions will take you. There have been many recent behind-the-scenes developments here at A Wandering Heart and I’m so excited to slowly reveal everything I’ve been working on. The first part of this began with the launch of this new website back in August. The second was the release of my print shop, L’Arte del Viaggio in November. These words couldn’t be more “me” and reflective of my own journey and, frankly, my obsession with travel! I’ve posted before about the importance of embracing the journey, and not just fast-forwarding to your destination. I also have a strong fascination with visiting the lesser-known cities, attractions and lands across this earth. Old buildings, especially ruins also hold a special place in my heart. They are magic! I originally studied architecture and interior design and have always loved historic structures so “unseen worlds” completely fit right in with my brand. The photos in this post are also reflective of memorable journeys, and also what happens when your plans fail. You see, one morning we decided to take an early train to Venice from Florence. However, we failed to pre-purchase tickets for our train. 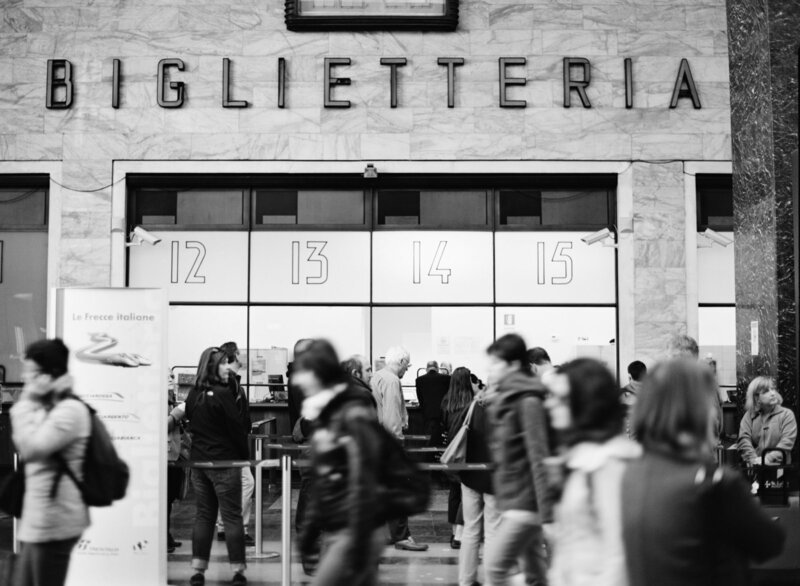 While most people would be frustrated (since we were only going for the day), we embraced the wait for the next train by doing a little shoot of Stazione Santa Maria Novella. These are some of my favorite images from the trip – not only because they’re black and white but because I truly embraced the moment and slowed down to capture the hustle and bustle of the station and travelers arriving and departing on their own journeys. This station holds a special place for me because I’ve been here so many times, and traveled through here with many special friends and family members. I’m SO glad our first train was booked and I had the opportunity to take these photos to remember this place. They take me back to that very morning every time. I’m really excited about this focused direction and can’t wait to bring you more journeys from unseen worlds. If you’re not already, you’ll definitely want to follow me on Instagram and other social media to see where my latest adventures take me. Some big one’s are coming up and more exciting announcements will also follow. Stay tuned!